The Cadence® Allegro® ECAD-MCAD Library Creator helps your team improve the quality and accuracy of the library. 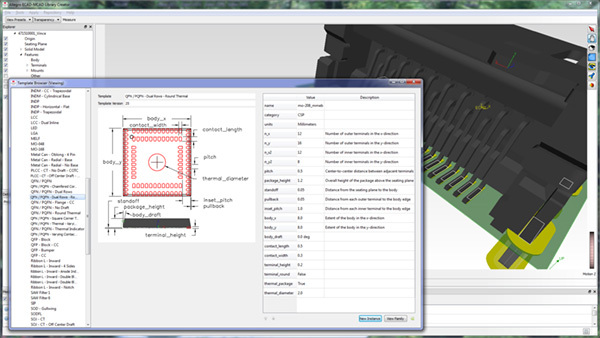 Connect your ECAD and MCAD libraries to make sure you have a complete picture of all your components. With 2D footprints and 3D models complete and in sync, your time can be spent less on creating libraries, and more on design. You can reduce component library creation time for new packages by 60-80%. Designers can choose from thousands of detailed 3D package models in the provided repository, create new packages from over 100 provided parametric templates, or leverage existing 3D models directly. Further, the Allegro ECAD-MCAD Library Creator automatically extracts and leverages geometric details from existing 3D models, dramatically reducing time and increasing accuracy when creating footprints. The Allegro ECAD footprints can be validated against existing 3D models to ensure consistency. When a 3D model isn’t available, one can be intelligently selected from the included library of thousands of STEP models. By connecting the ECAD and MCAD worlds, you’re able to improve your design process, shorten design time, and reduce the need for physical prototypes. Use the automated footprint generation and parametric templates with the Allegro ECAD-MCAD Library Creator to create multiple variations of components. Easily make complete new libraries for flex, different standards, and manufacturing processes simply by applying new target-specific rules to existing ones.